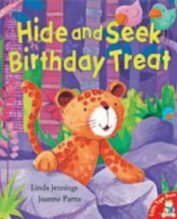 ‘Hide and Seek – Birthday Treat’ is a delightful little story book written by Linda Jennings and has amazing colourful and vivid pictures from Joanne Partis. The basic storyline follows Leopard as he wakes up on his birthday and is incredibly excited! He is going to invite all his friends to a wonderful party and make them all a magnificent cake! He goes off into the jungle to find them all but is soon very disappointed because everywhere he goes there is no one to be found – Lion is not in his smelly old den, Zebra is not out on the windy plain, Tiger is not in his wild woody place, and so it goes on. Poor Leopard is getting more and more despondent as he cannot find anyone to invite t his party! Before he knows it, it has become dark and he pads wearily home only to discover that all his friends are actually there and have arranged a surprise party for him – a happy ending after all! This book is really very enjoyable for a number of different reasons. Although the story is quite a simple one, it is all written in rhyme which gives it a lovely flow and rhythm. All of the verses are written following the same pattern which makes it quite easy for young children to predict the rhyme and to join in as it becomes more familiar. There is also some beautiful language used in the story particularly in the descriptions. Leopard wakes up with a ‘fluttery tummy’, and seeks out friends in ‘wild, woody places’ and looks for a ‘snappy, cunning and mean’ crocodile as well as a ‘slippery snake’. These are just a few examples of lovely words to enjoy and talk about their meanings. There is also a fair bit of alliteration such as ‘bright birthday’ and ‘wild woody’ places, which for four year olds is very good as it is starting to help to develop their phonological awareness. I have already mentioned that the pictures are wonderful – bright, bold and colourful with lots of interesting detail on every page which means that there is a lot to talk about without even reading the story. But there is something even more interesting about every picture which you have to look very carefully to spot! Everywhere Leopard goes to find his friends and they don’t appear to be there, they are actually hiding but are very well camouflaged! Very observant children will soon spy these creatures hidden by leaves, trees, flowers, etc. My favourite one is where Leopard looks for the crocodile and he goes to the river. There appear, at first glance, to be three logs floating, but on closer inspection there are only two, and the third is actually the crocodile! My daughter really enjoyed the actual story too particularly because she loves both birthdays and happy endings! She was a bit worried about halfway through the story because she really thought that Leopard was not going to have any friends at his party, but of course that made the ending even better. It did make me think though that I would be a bit cautious about reading this with a small child just before their birthday because they might worry that they might not have anyone coming to their party either! But of course this is not the case in this story and Leopard really does have a very happy birthday! No Comments on "Hide and Seek – Birthday Treat"